It’s elderflower season, finally! The gullies + back lanes around our town are awash with their splashes of lacy whiteness, and all the goodness they bring. Starting with wild elderflower soda, our family’s favourite. And there’s so many other uses, too. Native to most of Europe and north America, elder (Sambucus nigra) is a spindly stemmed, fast-growing deciduous shrub that flowers wildly in spring, followed by deep black clusters of berries. 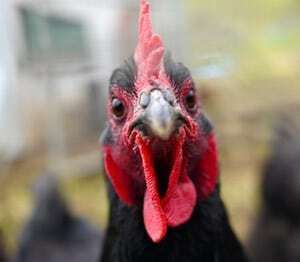 It requires fertile soils, but will grow in either wet or dry conditions. There are many other Sambucus species that are also known as elderberries, but Sambucus nigra is the one that is most commonly eaten and used for medicinal purposes. The elder is an old medicinal and beloved plant that has naturalised far beyond its native lands. 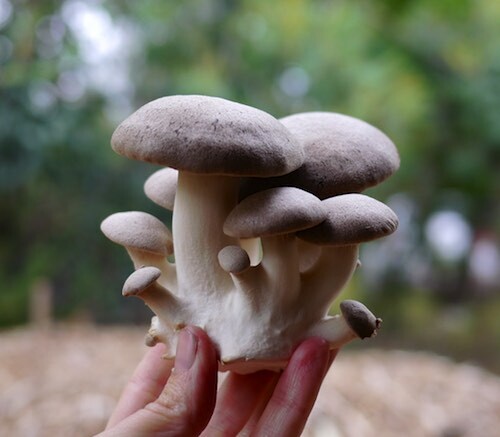 It is a powerful plant that should be approached with caution as some parts of it can be toxic, particularly its larger stems, leaves and unripe berries, as well as its bark. 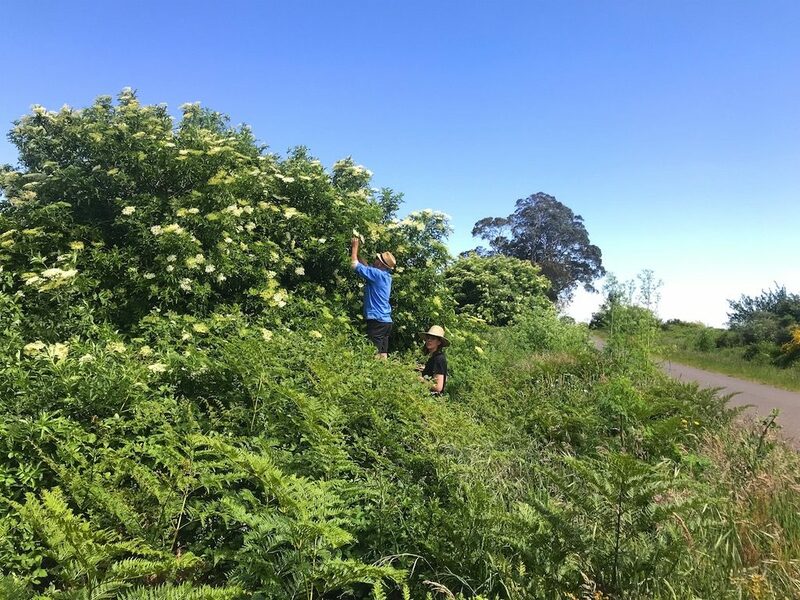 The elder flowers and ripe berries can be gathered safely, however, and have such a special taste and beneficial attributes that learning how to deal with this lovely weed is entirely worthwhile. 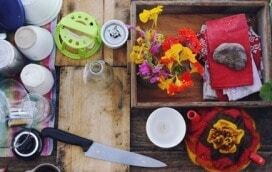 Gather a big batch of the flowers in spring (right now!) and remove them from their larger stems, then proceed into elderflower everything. 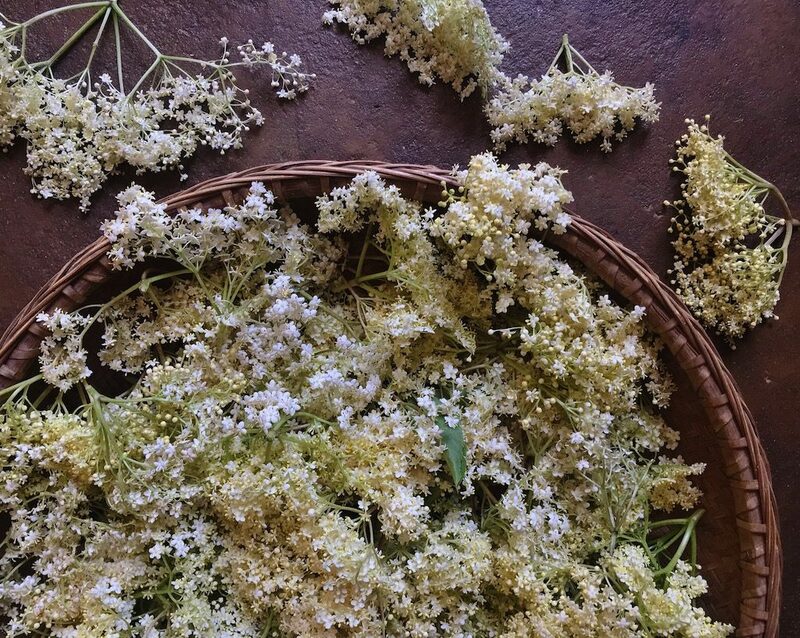 You can dry the elderflowers on paper or on a fine mesh rack, to use in drinks and herbal teas, and to sprinkle on salads and cakes. Elderflowers also make an amazing cordial that is fantastic on a hot day, diluted with mineral water and served with fresh mint. You can never make too much of this! This is a spring recipe that we love. It’s family-friendly and entirely delicious as an afternoon treat. The fizz comes from whey and the copious yeasts in the elderflower pollen. Because there is so much fermentation potential in this recipe in the form of pollen yeasts, it ferments very quickly, before all the sugars are consumed and the alcohol content rises. This means everyone can drink it, not just the big people in your household! 1. 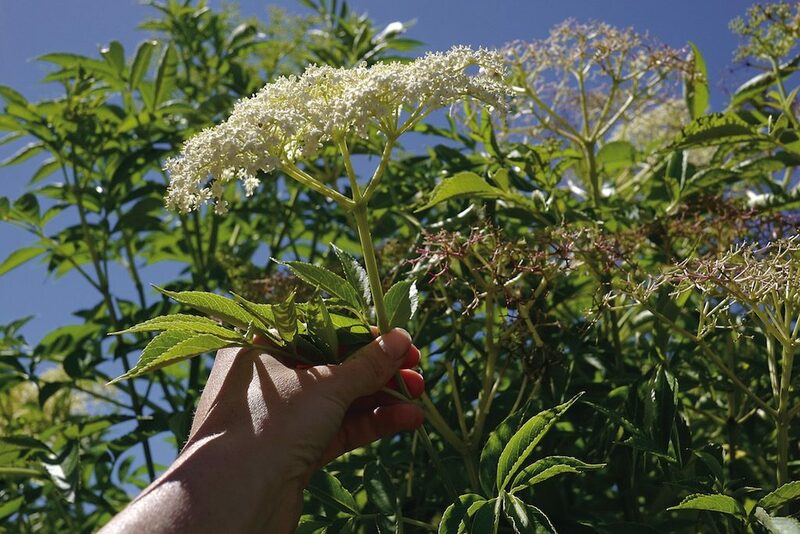 Remove the large stems from the elderflower heads with scissors. Some people remove all the stems, but we don’t bother. 2. Fill a 2 litre (8 cup) jar three-quarters full with the water and add the honey, stirring to dissolve. Add the whey and then the elderflowers, stirring them all around. 3. Place the uncapped jar somewhere warm, where you will pass it multiple times a day. Lightly cover the top with a cloth to prevent critters getting in. 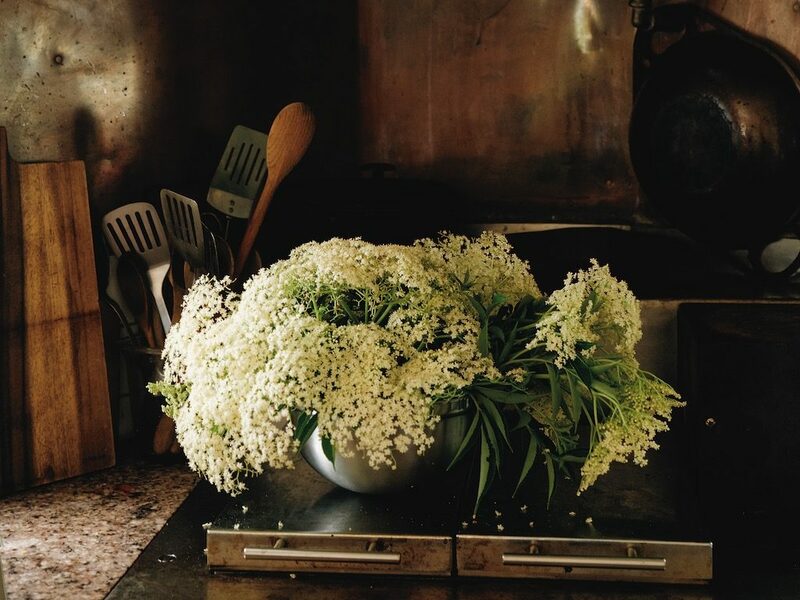 Whenever you pass the jar, give it a stir to submerge the elderflowers – they will whirl around and then rise back to the top. 4. Within 2–6 days, depending on room temperature and the wild yeasts in the elderflower, the mixture will start to bubble. Taste it and see if it’s fizzy yet. 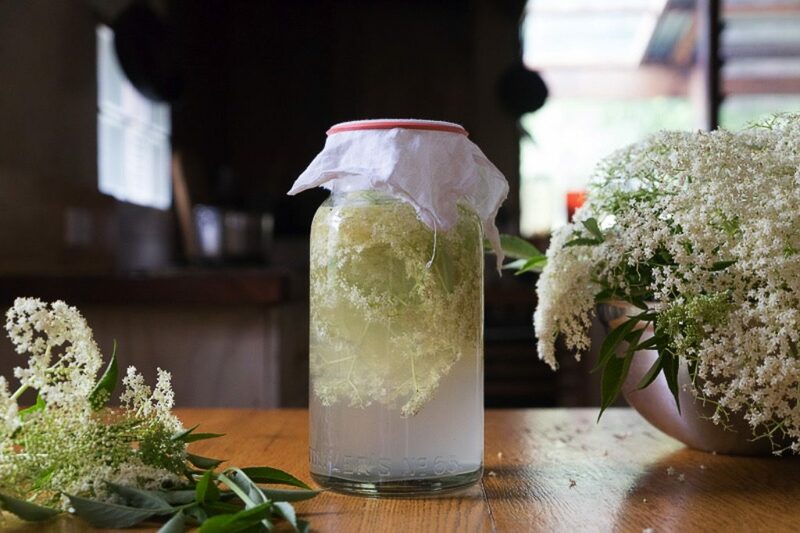 If yes, ta da – you’ve made elderflower soda. If no, leave it a little longer. Once it’s done, strain off the solids. 5. Now you have a decision to make. You can bottle and chill the soda, which will have a very light fizz, or you can bottle it in swing-top glass bottles or plastic bottles and leave them on your kitchen bench to let the fizz build for a day or two. The pressure will build up, so be careful when you open the bottles. When it’s as fizzy as you like it, chill the soda to halt fermentation and drink it within a day or so. Cheers. The longer you leave the soda to ferment, the drier it will taste as the yeasts eat all the sugars. It will also become more fizzy, slightly alchoholic and potentially explosive when opened, so be careful. 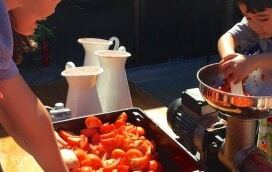 The above is an extract from the Wild Food chapter of our new book Milkwood – real skills for down to earth living. You can buy a signed copy from us, or hit your local bookstore or library! Overseas folks, go here. We have some exciting news to share, both for us and for you. Fro . .